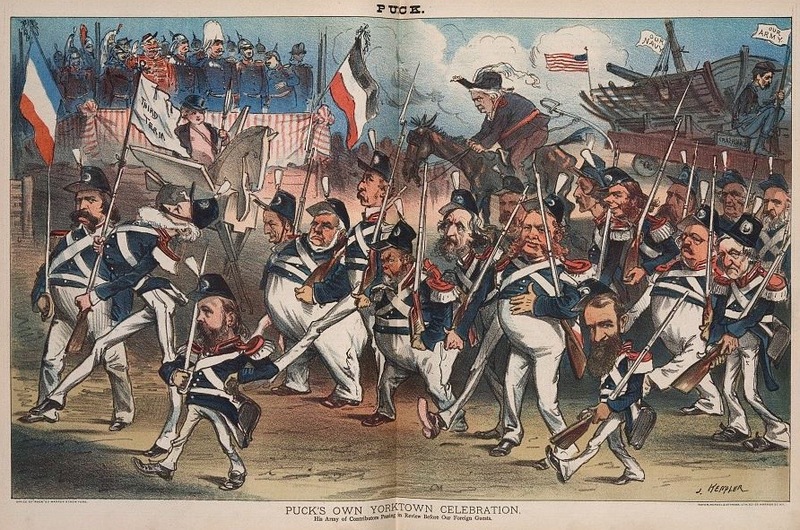 Puck magazine turned ten the year of the Yorktown Centennial. Sort of the Onion of its day, it naturally poked fun of the occasion. I have been preparing this week for Civil War Weekend at Governors Island, which is this Saturday and Sunday. One of the most fascinating periods in the island’s history is the stretch from 1878 until Elihu Root’s reforms began transforming the island in the early 1900s. Eighteen seventy eight is the year Winfield Scott Hancock arrived and took command of the Department of the East. He quickly had his hand in many things, one of which was the Yorktown Centennial of 1881. That was the anniversary of the American and their French allies took on the British and their hired guns in Virginia. The battle involved none of than the General George Washington and the Marquis de Lafayette. 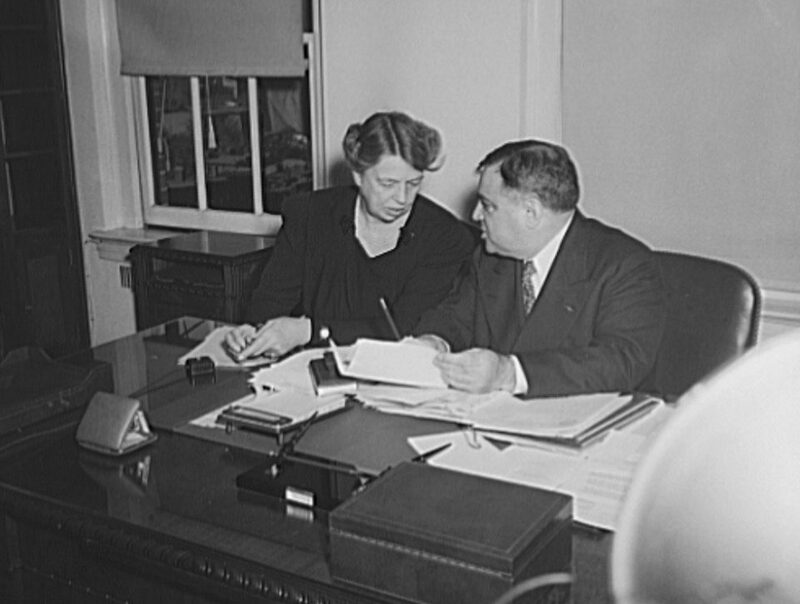 A Congressional organizing committee was put together that included none other than Joseph Roswell Hawley. When we think of the post-Civil War era, we immediately think of the reconciliation vs. emancipation paradigm that underscored so much of the nation’s domestic politics. 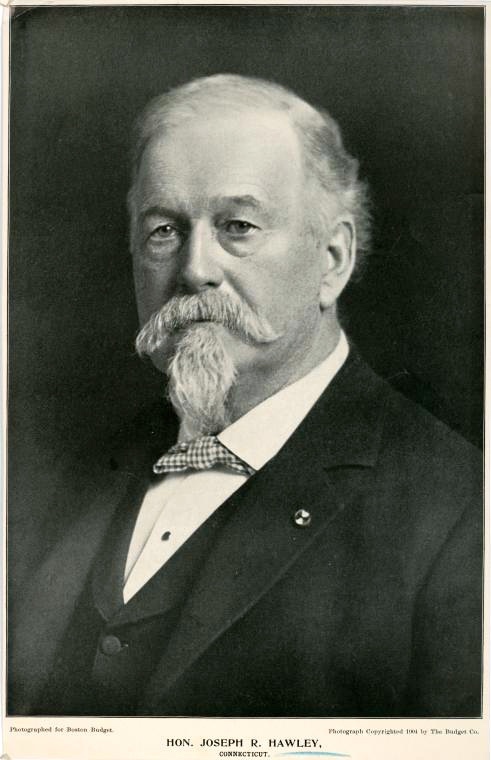 (Hawley himself had been a Civil War general and was very much part of the reunion circuit until his death in 1905.) It is important to remember though that so much more was happening. The Gilded Age was in full swing when the U.S. and France marked the occasion of their great Revolutionary War victory. Other nations were represented as well, but Yorktown 1881 was really a Franco-American affair. The timing could not have been better for a reunion of these once and former allies. Relations between France and American had become strained over the previous twenty years. Most egregiously, Napoleon III had stuck his nose in North American affairs, trying to undermine the fragile peace that existed between Mexico and the United States in the wake of the Mexican-American War. He even managed to get Maximilian I, the brother of Franz Josef I, installed as the ruler of Mexico in 1864. France and the United States might well have gone to war after Appomattox had things gone a little differently. It was that close. There were some glitches during the Yorktown Centennial, especially relating to such logistical issues as accommodations. Still, the commemoration was a big success and did much to restore the Franco-American alliance that had fractured during the Civil War. The memory of Lafayette had a great deal to do with that. On the 4th of July 1917 the 16th Infantry Regiment made its famous march to the marquis’s grave at Picpus Cemetery n Paris, where a senior officer famously declared “Nous sommes ici, Lafayette.” In the 1920s, after the Versailles, the 16th was stationed on Governors Island. It’s 6:40 and I am here on the couch having a quiet moment before leaving for Governors Island. Somewhere along the way today I am going to squeeze in a mention of D-Day. When I was growing up June 6 was always a big deal; nowadays the anniversary of the Normandy Invasion barely registers. Only one person mentioned it to me yesterday. I suppose that’s the way it goes. A few years ago during the sesquicentennial I wrote about the Liljenquist Collection at the Library of Congress. A few years ago the Liljenquist family donated their sizable collection of Civil War photographs and daguerreotypes to the Library of Congress. Soon after that donation the Library put a sizable portion of the donation on display. It is funny how the sesquicentennial is already receding into memory. The image above came through my email the other day. 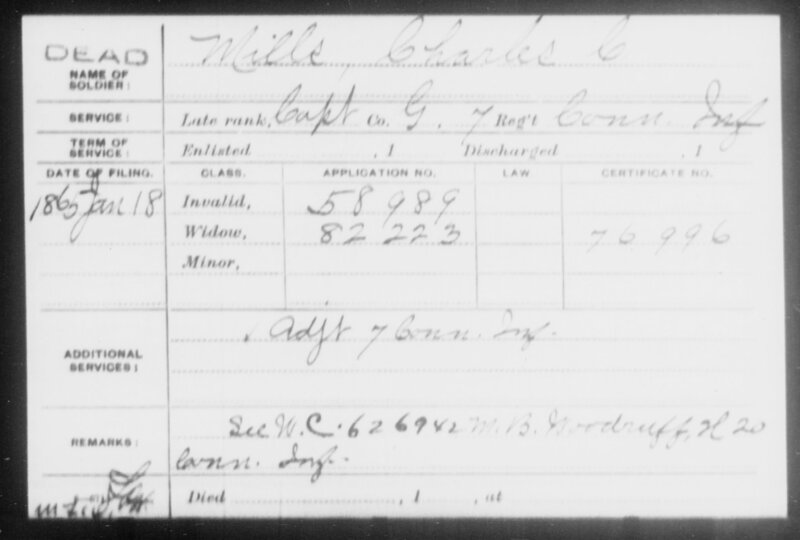 It is Private Hiram L. Barrett of Co. K, of Joseph Hawley’s 7th Connecticut Infantry Regiment. The little girl is Marrie. 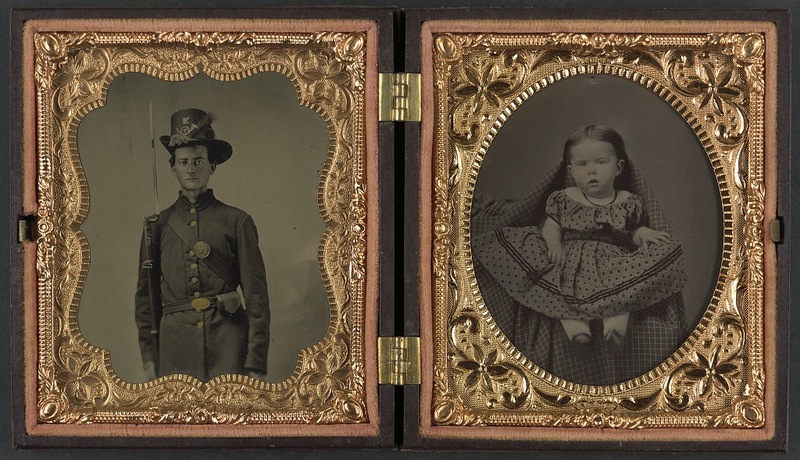 The metadata explains that the photo of the baby is probably from 1853. The Liljenquists bought well and wisely. The quality of the images is stunning. Joseph Roswell Hawley died 110 years ago today. Longtime readers may remember way back when I mentioned that I was working on a book project about the general. I thought it was a good time for a progress report. The Hawley project is still in the works though it has taken a back seat to the Theodore Roosevelt Sr. monograph. My original intention was to work on both at the same time. That proved to be impossible. Early this past fall I made the decision to go full steam on one or the other. It was difficult because they both mean so much to me. Ultimately it came down to the advice of my wife and one of the rangers at the Theodore Roosevelt Birthplace. Both told me that Roosevelt Sr. should be my focus. And so that’s what it became. A biography actually came out in late 2013 called ‘Fighting Joe’ Halwey by a journalist from Connecticut named Kevin Murphy. Murphy did a fine job. My book will focus on Hawley’s life in a somewhat different manner. Hawley was a Zelig-like character who always seemed to be where history was being made. Actually the overlap between Hawley and the Roosevelts is quite fascinating. Hawley and Roosevelt Sr. were both friends with Frederick Law Olmsted for instance. Years later, when Hawley was in the Senate and Theodore Roosevelt Sr. was long gone, Hawley was an ally of President Theodore Roosevelt. Hawley left the Senate after eighteen years of service just as Roosevelt was about to be sworn in for that second term in early March 1905. He died two weeks later. As you might be able to tell, I am eager to get back to this. All in due time. I was in Green-Wood Cemetery this afternoon for a quick walk when I came across this headstone for one of the men from Joseph Hawley’s regiment. Hawley notes in the 7th’s regimental history that Mills had returned from recruitment duties just in time for the fighting at Pocotaligo in October 1862. 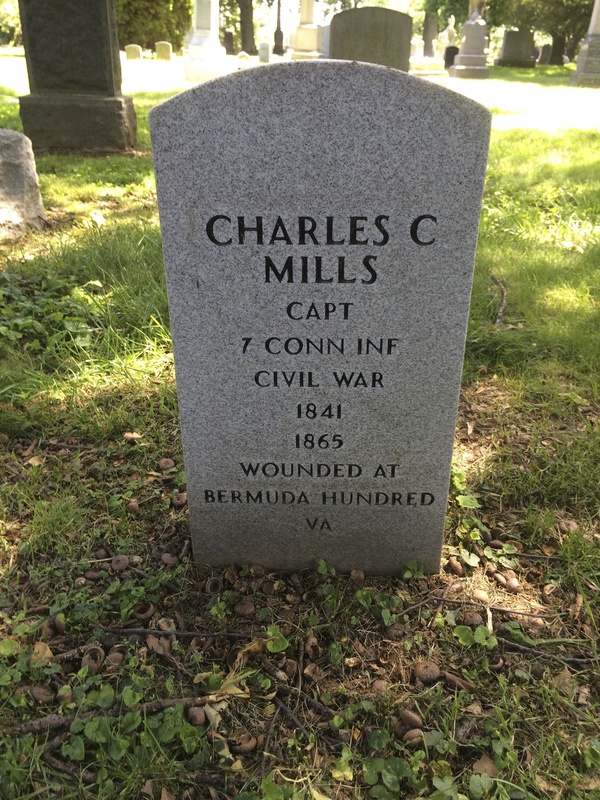 Mills is mentioned again during the fighting in the Bermuda Hundred outside Richmond. There, 150 years ago this month, Mills was mortally wounded when shot in the chest. His death must have been traumatic for all involved. 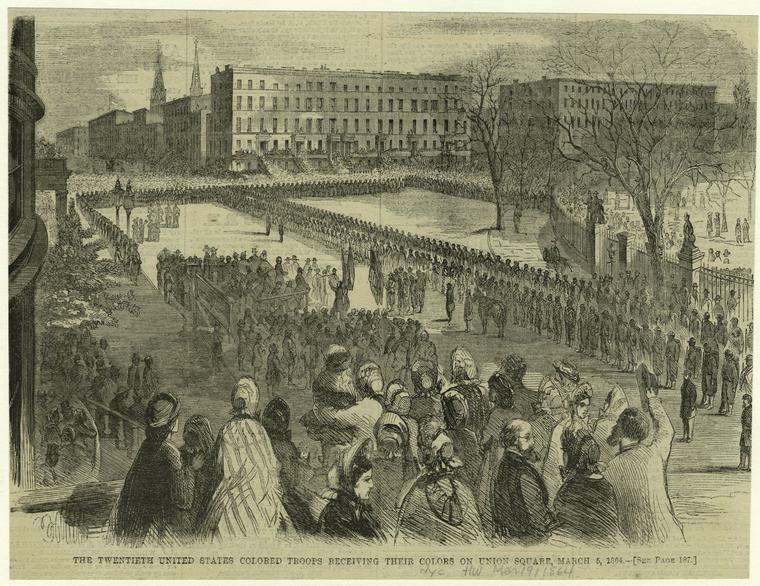 According to Hawley, his and Mills’s wives, with a few other officers’ spouses, “made a social circle which formed an oasis in military life which was remembered with great pleasure in the continuous battles from July, 1863 to the close of the war.” In early January 1864 when the fighting was again about to heat up ” All the ladies, except Mrs. Hawley and Mrs. Mills returned north.” It must have been a difficult death if he held on for another six months before expiring in January 1865. I would love to know the circumstances of how he came to be buried here in Brooklyn. 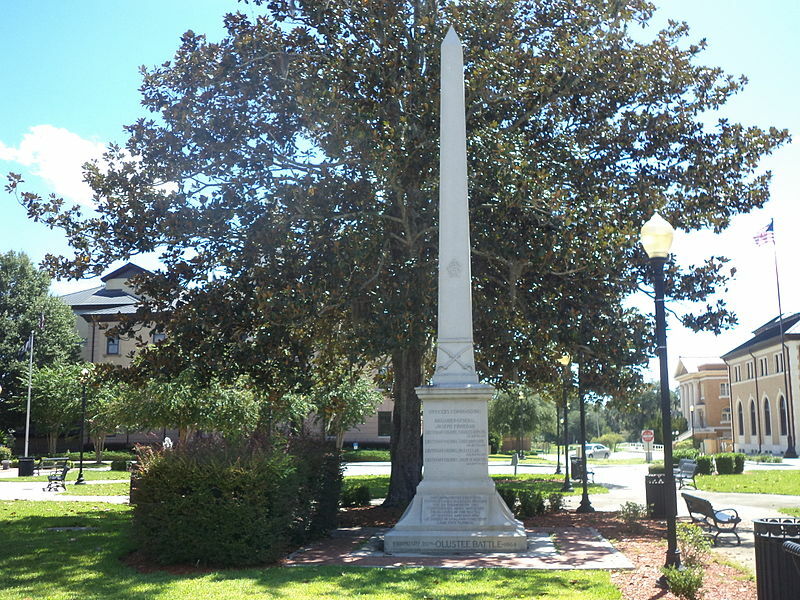 From the “War that never ends” department, a curious story is emerging in Florida in which people are getting angry about a proposed Federal monument to be placed at the Battle of Olustee state park. It seems there are three Confederate, but no Union, memorials at the site. I have never understood these imbroglios. Here is a small piece, complete with video, explaining more. Olustee is actually one of the places I will be visiting as I retrace the steps of Joseph Roswell Hawley in the writing of my biography of him. I really want to see what comes of this story. It was an unseasonably warm day here in the Big Apple, I just got back from a meeting of the Archivists Round of Metropolitan New York at Green-Wood Cemetery. 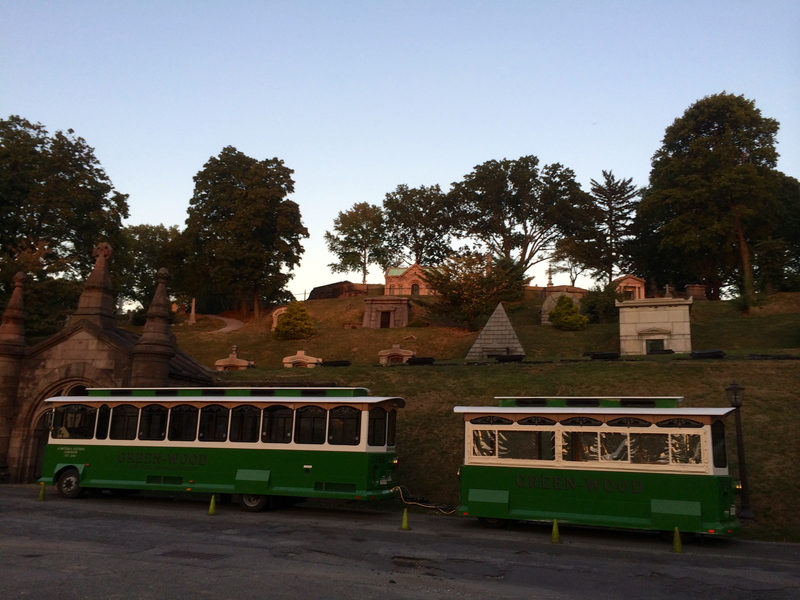 It was a chance to see and hear about some of the behind the scenes activities of the 175 year old garden cemetery. A special treat was to behold the original hand-written list of men from the 14th Brooklyn wounded at Gettysburg. Many of the men from the 14th are now interred there, some having died of their wounds and others having returned from the war to live out the rest of their natural days before meeting again in Valhalla. As I said a few weeks back, I am trying to think holistically in my personal and professional endeavors. Yesterday I started Brenda Dougall Merriman’s Genealogical Standards of Evidence: A Guide for Family Historians, a primer on the basics of proper genealogy. It is part of my longterm plan to become BCG certified. This morning I emailed a friend who agreed to critique my book proposal to see if he would read it and comment by the weekend after next if I got it to him one week from today. It is part of my plan to keep my feet to the fire. It is so easy not to do it. 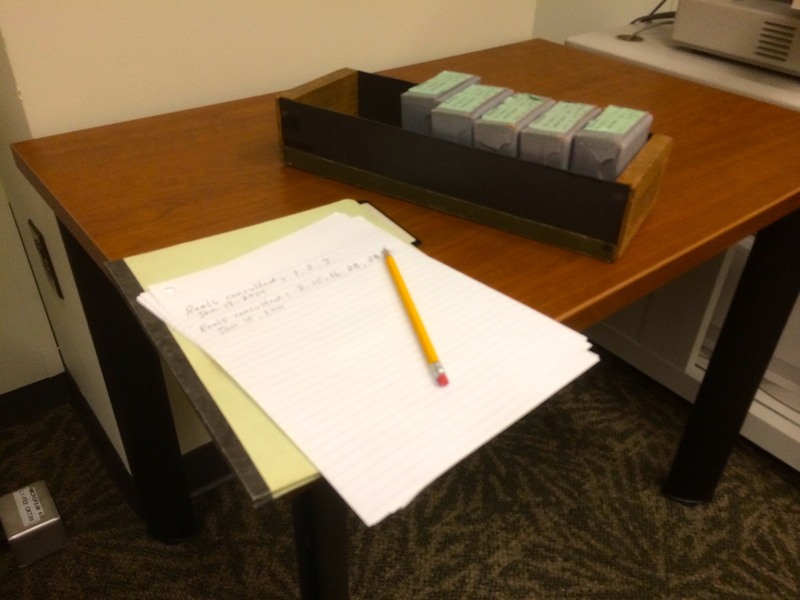 In a piece of serendipity, a colleague in the library where I work asked in the afternoon if I want to be part of a writing club she is founding. The idea is that once a week the group will get together to check our progress, read each other’s work, and that type of thing. I think this is going to work well. We admire those who risk their lives in battle, but sometimes forget that patient endurance is as heroic as bravery in battle. Dotting the I’s . . .
≈ Comments Off on Dotting the I’s . . . The Union League Club of New York funded the 20th USCT. I have spent the last few days putting the final touches on my upcoming talk at the New York History conference later this week. There were two parts to put together, the photographs I will use as visuals and the outline of the presentation. Cooperstown should be fun. I will be speaking about Theodore Roosevelt Senior,Williams E. Dodge Junior, and their cohort of New Yorkers, many of them Union League Club members, who helped Lincoln fight the Confederates, and then helped fight Boss Tweed, Tammany Hall, and municipal, state, and federal corruption in the Gilded Age. Along the way they also created many of the institutions New Yorkers take for granted today, such as the Metropolitan Museum of Art and New York Botanical Garden. I just got off the phone with the Hayfoot, who looked at my outline and, as always, gave me some sage advice. With some exceptions, Civil War New York is a story that has not been told well. The major contributor is of course Barnet Schecter, whose The Devil’s Own Work should be on everyone’s reading list. Along with my Joseph Hawley biography, this will be my big project for the next few years. In a way they are even the same project. In both cases my emphasis will be on creation of the Republican Party in each state (Hawley helped found the Party in Connecticut in response to the Kansas-Nebraska Act, while Chester Arthur was doing the same in the Empire State.) and continue through the early years of the Progressive Era when that generation died off. You could say I am putting the “era” in Civil War Era. Really one has too, though. So many people focus on Fort Sumter to Appomattox as if those four years happened in a vacuum. You cannot understand the war with that approach. 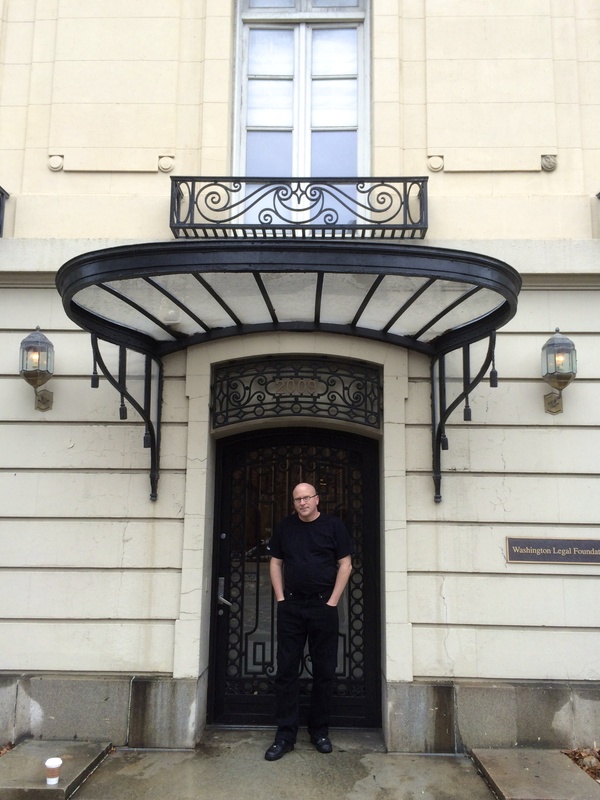 I am fortunate that most 0f the materials I need are located in repositories here in New York and in Washington where the Hayfoot is working for the time being.